Kids may know The Umbilical Brothers from their television series The Upside-Down Show, Disney’s The Book of Once Upon A Time and The Sideshow and Maisy, but parents will also be familiar with the international comedy duo who have won an Emmy award, Logie award and performed live continuously around the world since they first appeared on the comedy scene. 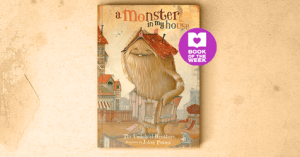 Yet their talent doesn’t stop there – now they have tapped into their ability to capture the imaginations of children with a fun filled new picture book A Monster in My House. Dedicated to the curious and kind creatures everywhere, the pages are filled with intricately drawn pictures of gruesome yet strangely appealing monsters. Thanks to stunning illustrations by German artist Johan Potma, there is a very hairy, one eyed creature with a green tongue, toe nails and finger nails; an octopus style, drooling parent and baby; one monster is so large its head has broken through the roof of the kitchen as it casually stirs a monster stew, making you wonder what monsters put in their stew? The list goes on and so do the weird and wonderful monsters. Things are not always as they seem however, and there is a bit of a twist in the story – we won’t give it away, but the clues throughout will surprise and delight little monster lovers. This funny and creative story also rhymes and is destined to be a favourite that is read over and over. There are little details throughout A Monster in My House and the more you look at each of the pictures, the more you’ll discover with little jokes on shopping lists, in book titles and miniature paintings on the house walls. The brilliant combination of The Umbilical Brothers and artist Johan Potma has produced a hugely entertaining picture book that will have 4+ monster lovers repeating the rhymes and perhaps making up a few of their own, or even start drawing a monster picture or two! The Umbilical Brothers, Australian comedy duo David Collins and Shane Dunda, boast an international reputation. Named as two of Entertainment Weekly’s ‘100 Most Creative People In Entertainment,’ the Umbilical Brothers have appeared on The Late Show with Stephen Colbert, after James Brown at Woodstock ’99, and before the Queen. 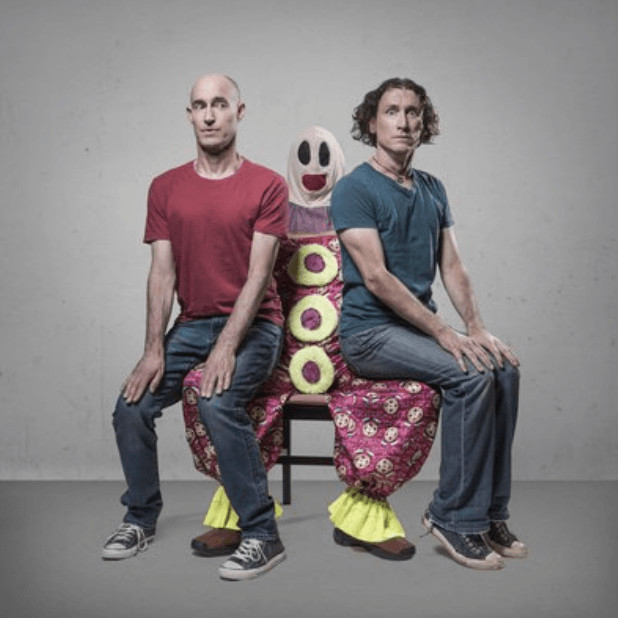 Their unique fusion of physical and vocal comedy has seen them supporting Robin Williams and entertaining audiences at the Sydney Opera House. They’ve also gained a fanatical toddler and late-night, potato-chip-eating college fan base with their television series The Upside Down Show, Disney’s The Book of Once Upon A Time, The Sideshow and Maisy. Johan Potma is a Dutch painter and illustrator who lives and works in Berlin, Germany. His work is made with acrylics and collage on old wooden surfaces like box lids, signs and cigar boxes. The used materials tell part of the story through the stains, old nails, dents and cracks; the remainder of the story is explained through all sorts of monsters, freaks and oddballs acting out his ideas.